I’ve slowed down on the Random Rursday thing. I found it had become something of a chore, and I stopped getting Thursday nights as reliable hobby nights. I also found I wasn’t really giving enough time for paint to dry between stages. I’m still painting some random miniatures between other projects, just without a specific schedule. 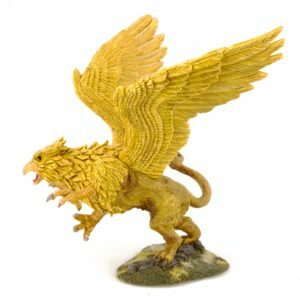 The Griffon is a Reaper Bones model. I like the textures in the fur and in the feathers. The base even is a bit more interesting than most of the Reaper models, with some stones sculpted in. I regret not doing a bit more variation in the front section, especially on the wings. This is a big enough model that it looks kind of sparse. On the other hand, I’m not sure I wanted to spend much more time on this model. I put some flock and static grass on the base, because I wasn’t very happy with how my painting of the grassy parts turned out. I think this model qualifies as my longest-running work-in-progress. It’s a leftover from my 2nd/3rd edition days, although it sat as bare, so wasn’t really in progress. In May 2012, I played in a “de-escalation” event at KublaCon. After each game, there was a chance that any models killed would stay dead for the next game. 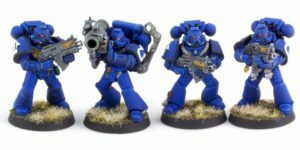 There was a bonus to vehicle rolls if you brought a Techmarine or equivalent. I wasn’t as strict about only playing with painted models then, but I gave this guy a quick red spray with the airbrush so at least it wasn’t completely bare. And there he sat, unloved, for two and a half years. Part of my backlog is anything with paint, so I needed to get this guy done. I decided to do most of the detail work (wires and stuff) in blue, to try to tie it into the rest of the army a bit. The model has a power axe, so WYSIWIG demands I take it on my list. It’s kind of a silly upgrade though — he already has a servo arm, which is S8 AP1 Unwieldy. For 15 points, he has can use the axe instead, which is S5 AP2 Unwieldy, but grants an extra attack, since it isn’t a Specialist Weapon. That’s a lot of points for very little utility. I can’t bring myself to change the model, though. Maybe I could call it a lightning claw. That would give the option of Shredding at S4/AP3, plus give an extra attack with either the servo arm or lightning claw, since they’re both specialist weapons. I try to shoehorn any newly completed model into my next game, so I took this model in my campaign game last weekend. He pulled his own. I gave him an Auspex and put him in a drop pod with Sicarius and half a tactical squad. He ended up mostly being a cover granting/denying dude. He bolstered a ruin which contained snipers and a missile launcher combat squad, and used his auspex to remove the cover from a pile of cultists. 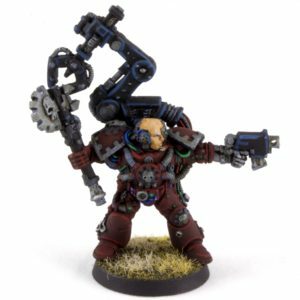 His unit ended up charging an inquisitor and his retinue, which included a servitor. I was very sad that a random marine took out the servitor before the techmarine could disassemble him. 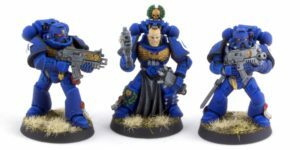 I think I’m going to turn my attention to a few Reaper models I’ve had primed for a while before coming back to the few remaining marines. I picked up this Sicarius model as part of a store closing sale almost a year ago. 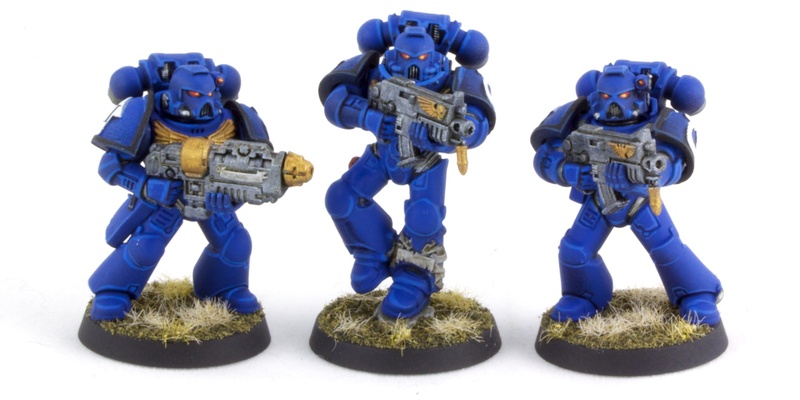 It’s the last of the Ultramarines HQs in my collection. 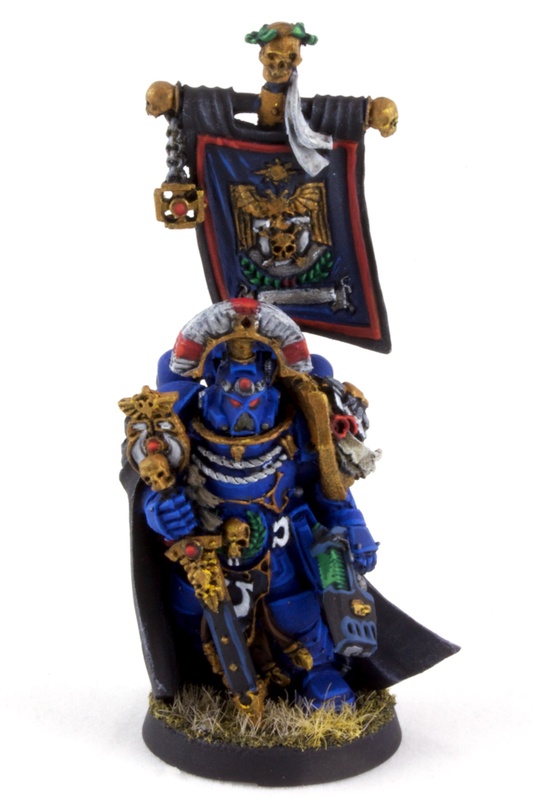 I decided to do him up in 5th company colors, to fit in with the rest of my Ultramarines. This is the Finecast version, and I expect it to be the last fully Finecast model I do. The gold detailing on the breastplate sheered off from the main body in places. I didn’t do too much to fix it — let’s call it battle damage. The sunburst pattern under the skull on the shoulder pad turned out a little weird. Maybe keeping it all gold or all silver would have been a better choice. Backlog keeps on shrinking. Next up is a Techmarine that’s been sitting unloved for far too long. My backlog is starting to clear up. 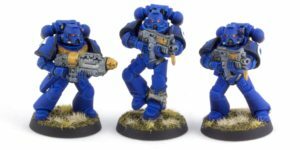 This Tactical squad is the third I’ve painted up in the modern era, and the first of the new kit released with the 6th edition codex. It offers a nice mix of bits. I went with sculpted shoulder pads. The tactical arrows are from Custom Minis on Shapeways. I went with the “frosted ultra detail” material, which is a little more expensive but supposedly has finer detailing. They’re nice, although you can still vaguely see the crosshatching from where the 3d printer did its thing. I sanded down the raised surfaces a bit, and it’s not very visible on the base. 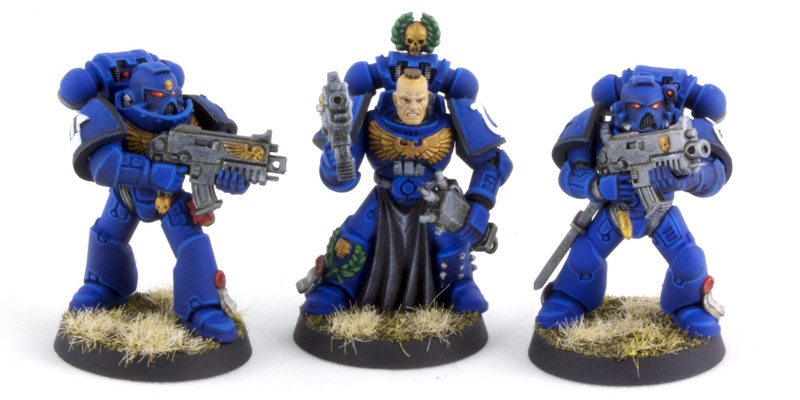 The Ultramarines shoulder pads are from Games Workshop. They’re a little less nice. There’s a bit of pitting in the resin pieces, but still workable. 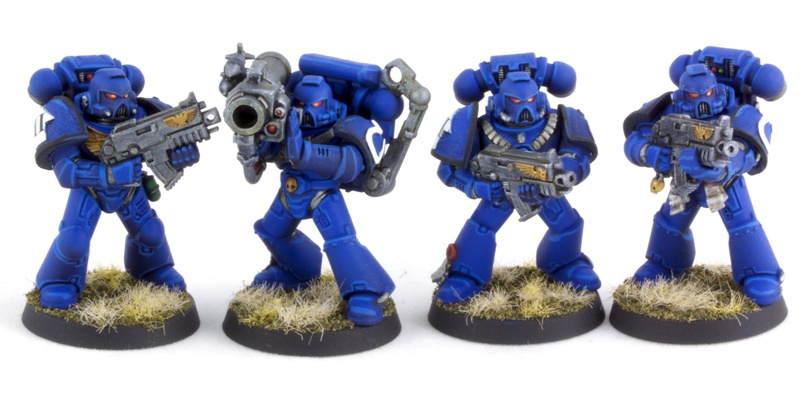 They’re also a little smaller than current shoulder pads, although it isn’t really noticeable on the completed models. I used a couple of spare bits from the Sternguard set (mostly used on the Deathwatch squad) to spice up the unit, like the sergeant’s legs. I also magnetized his guns and left arm, so I can swap out weapons at my leisure. The grav gun is of course magnetized as well, and the full set of specials is ready to go. I like to leave the arms off while painting, so that I can easily paint underneath. There are four sets of arm pairs in this kit, which need to match up. I needed to keep track of which one goes with which throughout painting. I hot-glued them to toothpicks for airbrushing, which is my standard practice, and put different widths of tape as little flags on each toothpick to indicate the pairings. I only noticed after I had carefully tracked them throughout the painting process, and was starting to assemble, that they all have matching details between the two arms. So you can pretty easily pick up any two arms and see if they go together. Just a few more to go before my backlog is complete! Then I can let myself buy more models. Updated December 2018 with improved images.